As temperatures begin to heat up, we folks in the colder states are shedding our coats and mittens to welcome spring riding season. If you haven’t yet been out on your bike, you may need to do a bit of prep work to make sure your first ride is your best. This is necessary even if you winterized your bike for winter storage. Did you know gasoline deteriorates very quickly? “Stale gasoline is an often forgotten yet very problematic issue with stored vehicles, so we recommend addressing your fuel and fuel system first, before anything else,” says bikebandit.com. If you winterized your bike correctly, you either drained the fuel or added a fuel to the fuel in the tank to extend the life of fuel to a year or more. If you drained the tank, take a look inside the tank for any rust, gunk, or condensation that could cause problems later. Next, fill your gas tank with fresh premium fuel that contains no ethanol, advises Totalmotorcycle.com. Most regular grade fuels contain ethanol, which is not the best for power sports applications - especially if you are not using them every day. More importantly, TMW says, add the recommended amount of fuel stabilizer. After changing the oil and after the bike has completely cooled down, drain the float bowls – if accessible on non-fuel-injected bikes) as extra insurance. There is no draining required on fuel injected motorcycles, since it is sealed from the outside air, they add. 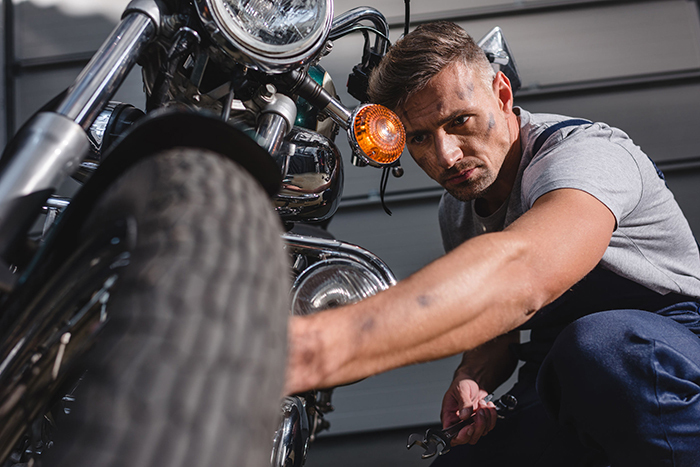 Additional tips include giving your bike a good cleaning and coat of wax followed by lubing your chain – if applicable, check your air filter and spark plugs, make sure lights and turn signals work, and give your tires a good kick to make sure they are properly inflated. “It’s better to check for these things in your garage than find out about them while going 65mph down the highway,” gearpatrol.com aptly writes. 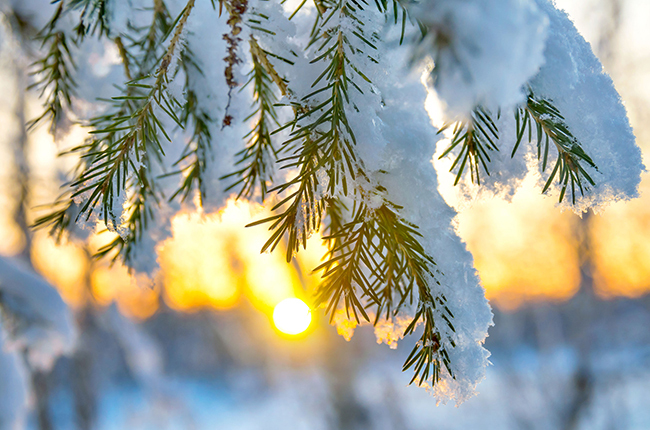 The Farmer’s Almanac predicted a cold and snowy winter for the United States – and, boy, were they right! “Although the snow was late getting here, it has been a banner year,” says Christine Jourdain, executive director of the American Council of Snowmobile Associations, based in East Lansing, MI. Above freezing temperatures here will soon bring an end to local snowmobile fun. But, hey, there’s always upper-Michigan. Remember in the 1979 Steve Martin comedy classic “The Jerk” when the new phone book arrived? Well, guess what? The new Fulmer catalog is here! The new Fulmer catalog is here! 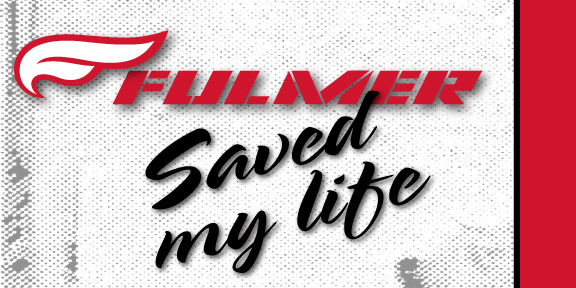 Fulmer™ Powersports brand new catalog is now available at fulmerpowersports.com, and we couldn’t be more excited to share it with you. Entering our 50th year, Fulmer continues the legacy and honors it in our 2019 catalog. Make sure to check out our timeline pages that breaks down important dates in the company’s history. What began with one single helmet has evolved to include a full line of helmets. New this year is the 360 Forge, a classic ¾-designed helmet with an iShade™ retractable sun shield. And, for those looking for a lighter helmet, we now offer the 358 FX1 and the 304 Kurio helmets. Make sure to also check out the 359 Oasis helmet. Two other helmets are set for release in Summer 2019: the 150 Mirage full face helmet (pictured in blue) and the Kryptek version of our successful 400 Cruz modular helmet. Fulmer isn’t just about helmets, though. We offer apparel and rainwear, accessories including goggles and gloves, helmet bags and covers to protect your powersports machines when not in use. New this year, are a full line of replacement parts by Factory Spec and Namura to keep your machines running like the day they were purchased. 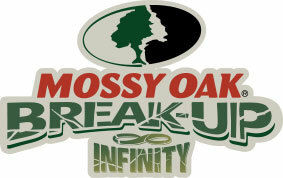 We invite you to browse our online catalog then tell us what you think. We are more than happy to refer you to a dealer in your vicinity. Welcome to the next 50 years. Are you one of those people whose thumb twitches in anticipation of snow, and revving up your snowmobile for the first time? Whether you snowmobile for the views, to hang out with friends or family, clear your head from the demands of life or be one with nature, snowmobiling is a lifestyle that appeals to people of all ages and backgrounds. Before the trails open for the season, here are a few tips and tricks to get your machine in tip-top shape. One of the most important parts of snowmobile prep is checking the machine’s track for any damage that may have occurred last year. Look for cracks and missing pieces, and make the track has the proper tension and hasn’t worn down to a dangerous level. Lastly, make sure each part of the track is present, including all clips. The snowmobile’s drive belt, found under the hood, is the next thing to inspect. Check for wear, cracks or signs it may be starting to fray. A good rule of thumb is to carry a spare drive belt with you I case of an emergency. While under the hood, also check the tension and condition of the fan belts and water pump belts. Next, do a visual check of the throttle cable. It should move freely and show no sign of damage, then lube it up to make sure it stays that way during the winter season. 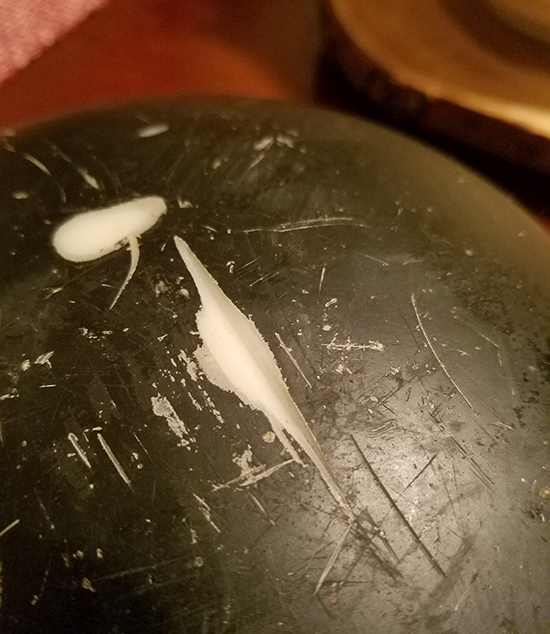 Finally, check the condition of the fluids inside the sled. If you added stabilizer to the gas tank when it was stored away last winter, you should have nothing to worry about. But it’s still a good time to take a look to make sure the gas hasn’t broken down. If it has, drain it and top off the engine coolant and oil. It might also be time for a fresh filter. 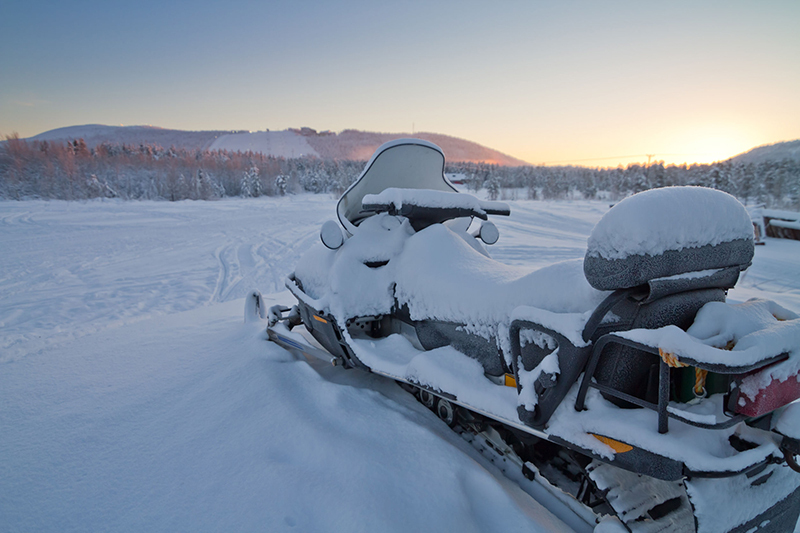 Preparing your snowmobile now will ensure a great season of riding. Winterizing a motorcycle is one of those preventative measures – and I don’t mean just covering it with a tarp. Preparing it for winter storage will make the start of riding season next spring a whole lot easier. The first step is pretty easy: Wash and completely dry your bike. A thorough cleaning is so important to the finish of the bike. Applying wax to painted surfaces and chrome polish to the chrome will also help keep moisture away. Next, fill your gas tank. A full tank of gas helps prevent rust from forming inside the tank, and treated gasoline helps prevent gunk and varnish from forming in the engine, according to instructables.com. Changing the oil and filter also will assure your bike is ready to go when you are. To prevent soft or flat tires, store your motorcycle on its center stand. To keep critters from spending the winter in your exhaust pipes, cover them up with plastic bags. Finally, a properly fitting motorcycle cover, like the one offered by Fulmer, will keep moisture out and protect your bike from dust and minor garage impacts. Your motorcycle says a lot about your personality, but what does your helmet add to the conversation? Different helmets do different things. You wouldn’t wear a football helmet while working construction, right? 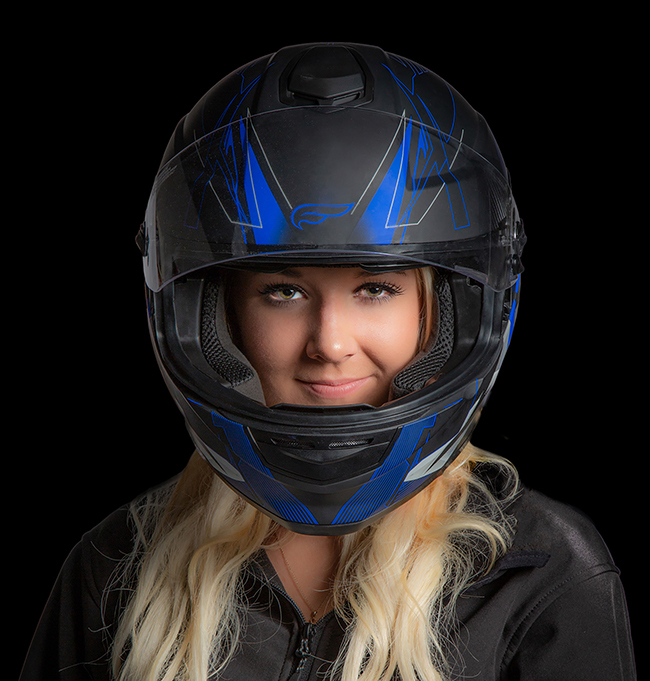 Likewise, a motorcycle helmet tells the world if you’re a careful rider, thrill- seeker, or a bit of both. Lucky for you, Fulmer carries a whole host of helmets sure to redefine your personality. 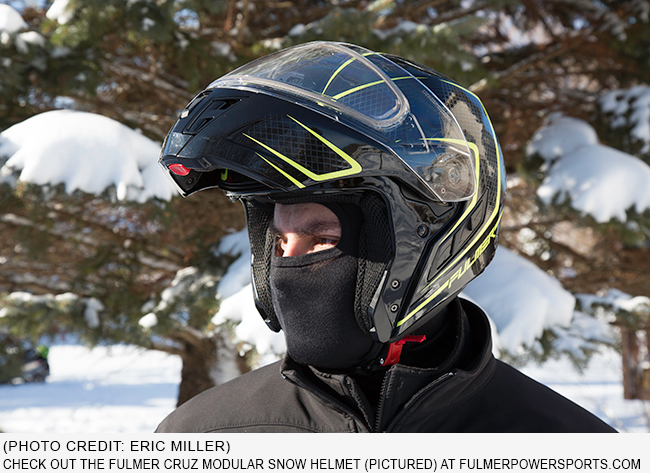 Take the Fulmer 151 Pulse full-face helmet. It not only looks good but provides the utmost in protection, which fits full faced helmet wearers who are cautious and careful. They wouldn’t be caught dead without a helmet on, even heading across town for a gallon of milk. Riders looking for more of a thrill when hitting the road, choose Fulmer’s open-face helmets, like the 353 Eon, which combines retro cool with modern day technology. Looking good and feeling protected are the modus operandi for thrill-seekers. Sometimes riders have a tough time making a decision between the two types of helmets. They’re sure about wanting the protection of a full-face, but love feeling the wind blow on their face. Fulmer has the perfect “in-between” helmet – like the 400 Cruz modular helmet by Fulmer. Push-button release lets riders enjoy some fresh air at a stoplight or while parked without having to remove the helmet. 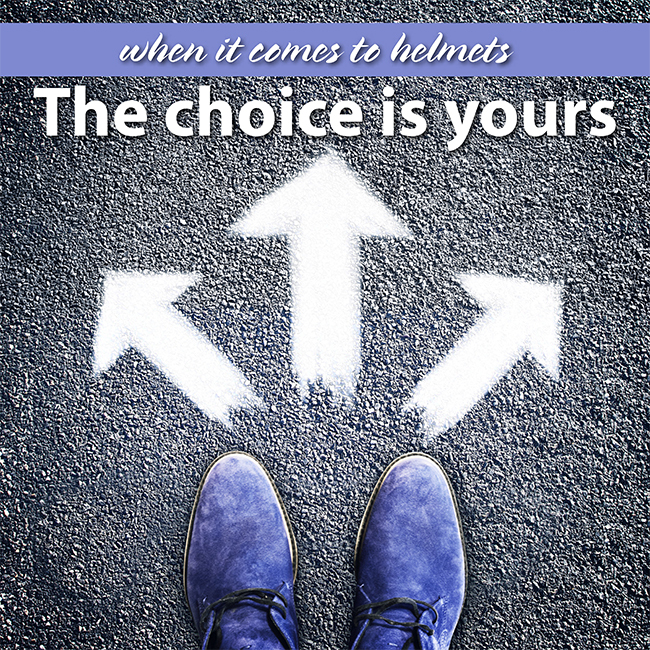 No matter what your style, we can’t stress enough how important a helmet is to your safety. It’s not a be-all-end-all answer, but wearing a helmet can protect a rider’s brain, face and life. One final thing a person’s helmet says about them is this: You are a responsible person and take motorcycling seriously. For more information on Fulmer’s full line of helmets, go to fulmerpowersports.com. William Self never understood why anyone would ride a motorcycle without a helmet. A serious accident July 28, reinforced that opinion. On a beautiful late July day, William and Ashleigh jumped on their 2002 Harley Road King about 2 p.m. heading to Paris, TN, about an hour’s long drive away. The plan was to enjoy festivities at the annual corn festival there, grab a bite to eat and maybe stop to do a bit of shopping at a few of the city’s antique malls. The couple made it about three-fourths of a mile down the road from their house when William noticed a black car parked on the left side of the road. It wasn’t moving or stopped at the intersection, so William saw no reason to stop his bike. When William came to he was underneath and off to the right of his motorcycle, with gasoline on his clothes. He pushed the bike off himself and went searching for Ashleigh. The paramedics soon arrived and took over, loading Ashleigh onto a stretcher and taking her to the nearby Basset Army Community Hospital for emergency treatment. So are we, William. So are we. 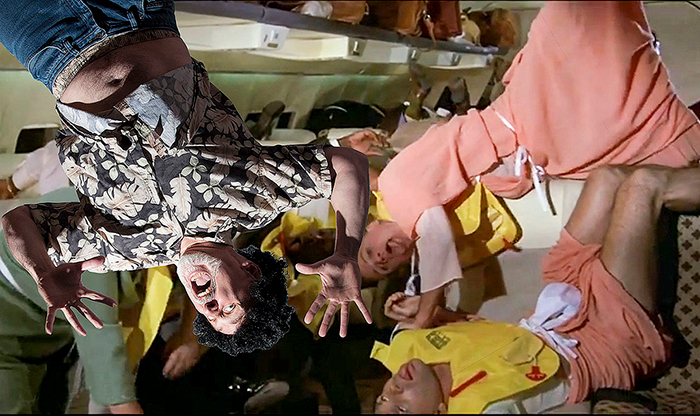 In the big finale of the 1980s cult-classic, “Airplane,” a pilot with a past and a “drinking problem,” attempts to safely land a plane. Seems the original pilot ate the fish entrée and, like many others on the plane, had a bad case of food poisoning. As the stewardess prepared the passengers for possible impending impact, she instructed, “Alright everybody, get in the crash position.” As you can see in the picture, the results were hilarious. 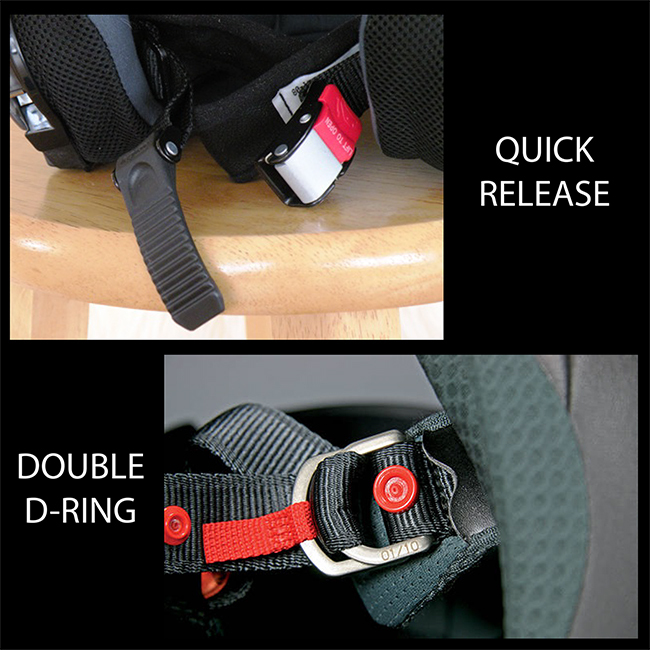 Safety, however is no laughing matter, especially when it comes to your motorcycle. We don’t want anyone to find themselves in a crash position, and it’s one big reason why Fulmer sells quality helmets. It’s why we so often hear back from customers who say our helmets saved their life or kept them from suffering serious head injuries. Head injuries are the leading cause of death in motorcycle crashes. 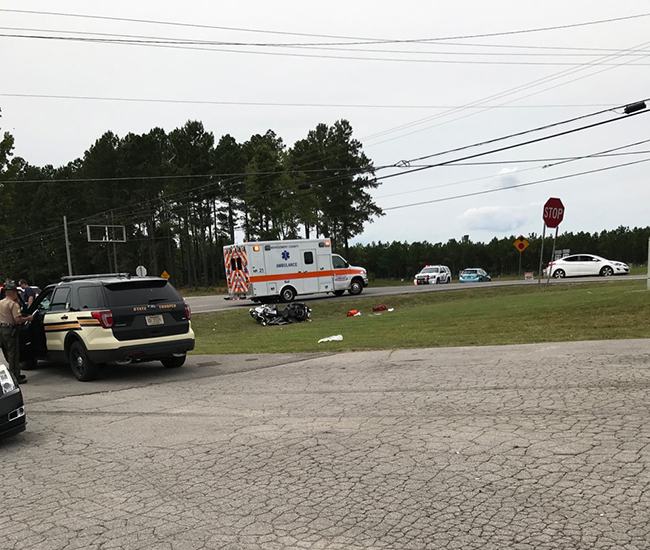 While motorcycle deaths were down slightly in 2017, fatalities on a bike occur 28 times more often than those of passenger vehicle occupants, based on miles travelled, according to a report by the Governors Highway Safety Association (GHSA). Wearing a motorcycle helmet reduces the risk of death by 37-percent, according to the NHTSA. Motorcycle helmet laws vary widely in the United States. Currently 19 states and the District of Columbia have universal helmet laws requiring all motorcyclists wear a helmet. Laws requiring only some motorcyclists to wear a helmet are in place in 28 states, and there is no motorcycle helmet use law in three states (Illinois, Iowa and New Hampshire). Check out your state’s requirements at www.iihs.org/iihs/topics/laws/helmetuse. While we respect everyone’s right to choose whether or not to wear a helmet, we stand firm in our belief that helmets save lives. We are serious…and don’t call us Shirley! Mat Parker’s Fourth of July didn’t start off with a bang. The 24-year-old man from Plattsburgh, NY was out for a ride on his 2008 Yamaha FZ1 along with a buddy, who had the night off of work. It was 11:56 p.m. July 3. Mat hit the deer, splitting it in half with the force of his motorcycle. He flew off his bike, tumbling 440 feet across the pavement. 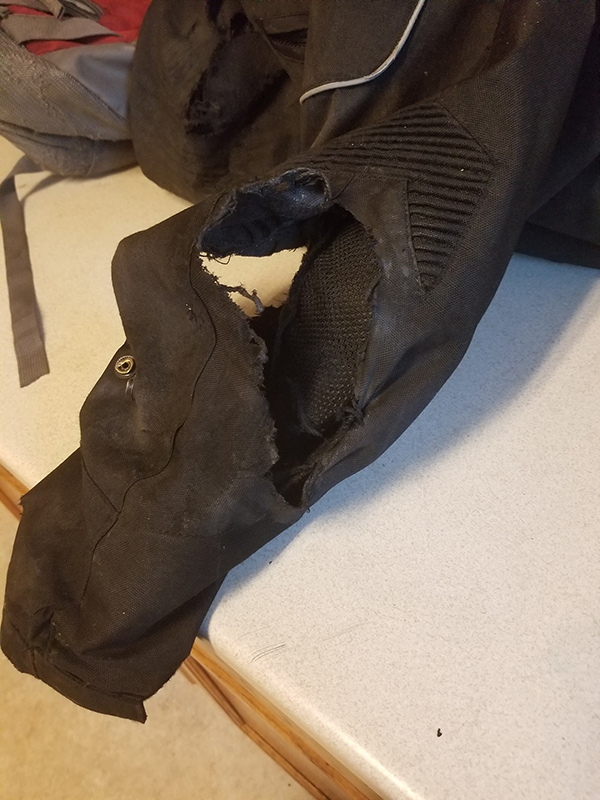 Rushed to the hospital by ambulance, Mat had suffered severe road rash on his knees, light road rash on his arms and surface road rash on his back where his jacket had ridden up. When bare skin scrapes against the surface of asphalt during a motorcycle crash, layers of the skin are quickly worn away. Glass, rocks, metal, and other debris from the road may enter the body through the wound and the injury can be significant. Road rash is a serious motorcycle accident injury. If it wasn’t for Mat’s Fulmer jacket, which he’d purchased from a local Harley dealer, his injuries would have been far worse, he said. 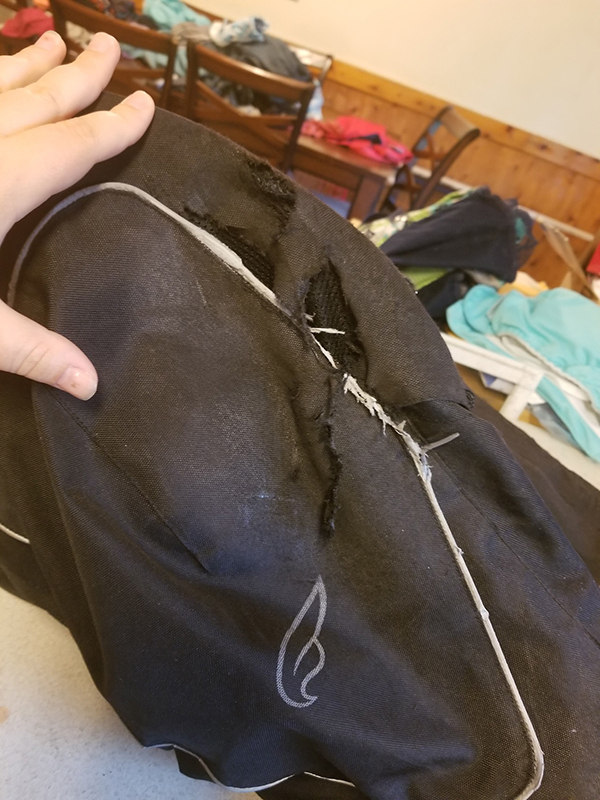 Even though areas on his jacket ripped, the protective pads stayed in place. Fulmer certainly didn’t save Mat’s life but it did keep his injuries to a minimum, and he is grateful.